Alcohol problems, bitter disputes between package store owners and casinos, crime and over commercialization might make Downtown Vegas a locals only hangout. 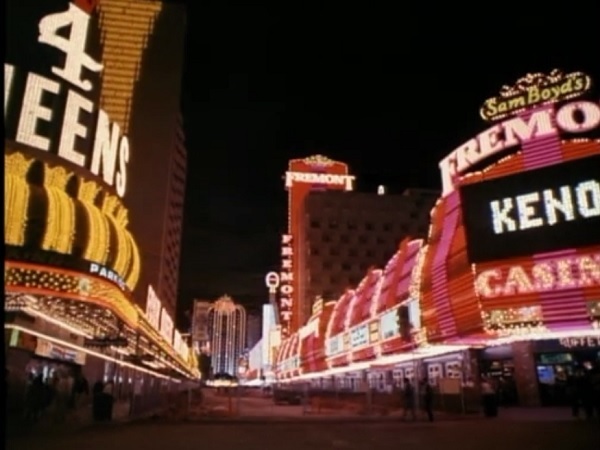 Before the Fremont Street Experience Canopy was installed You could see all the Downtown Casinos in one sight line. You could stand at main street and see all the way to El Cortez or stand at the Elcortez and see the Plaza which was then the Union Plaza. When the canopy was installed, it was awesome! Everyone loved it, even though the skyline changed You could still have about 80 percent of the same view. 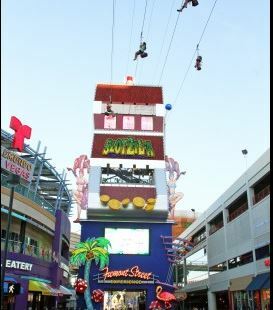 But in the last few years the Fremont Street Experience oversold Kiosk and allowed for a permanent stage to be erected. That stage totally hid the view of a landmark, the Plaza Hotel. And now what was the greatest restaurant seat in Las Vegas is less than average, that seat is at Oscar’s at the Plaza Hotel. But the worst idea of all that has totally messed up the view inside the canopy is the obnoxious SlotZilla. Slotzilla has to be the stupidest project in Las Vegas history. Now, all You can see downtown is this huge Slot machine zip line. How many People will use it? How many People will be annoyed by it? This is one of those things that would be a great idea for a weekend or even one summer but certainly not permanent. Now this eyesore is all You see and is driving People away from Downtown, People still want to see old downtown. The reason downtown was attractive was because it was much different than the Strip. How many years will this attraction stay before it must be torn down? How long will it be in operation before it no longer can make enough money to stay open? what will it look like as a giant slot machine, not a zipline? Add to this mess is trouble with the union which might be settled quickly but the other issue is about alcohol. The latest in that fight is the City wants to make a rule that alcohol bought at the package stores under the canopy cannot be opened under the canopy. WTF? So, I am going to go to the Fremont Street Experience and go to a package store but not open my purchase? It’s the same thing as saying the package stores cannot sell alcohol. Why would Anyone buy from the package stores inside the Fremont Street Experience to bring home with them? Something is really corrupt here and hopefully the lawyers for the packages stores will expose it. The City is also telling the package stores they cannot advertise their prices, they will not win the fight on this issue.